I believe our community is a tremendous place to live and deserves public officials who listen and work to achieve results for all of us. I am a small business owner right here in Apple Valley. I am not a career or professional politician and I do not aspire to be. I simply believe government must be ethical, honest, and to the point. I support greater transparency and open communication between elected representatives and the taxpayers they serve. As a small business owner I understand that free enterprise, not government, creates jobs. 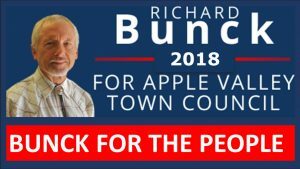 Entrepreneurship and family-owned businesses are the backbone of our economy and I will work with business and labor to bring good-paying jobs to Apple Valley. I will reduce regulations and cut red tape to make Apple Valley the ideal place for work. Like you, I am tired of politicians promising one thing and then doing another. For too long, Apple Valley residents have been gouged by our water providers. As your town council member I will put an end to these unnecessary rate increases and raise the quality of service. It’s about fairness and respect. Once again, thank you for visiting my website. If you have any questions, or if you have an idea you’d like to share, you can reach me directly at (760) 987-4282, send me an email, or reach out via social media. I am on Google+, YouTube, FaceBook and Twitter (@RichardBunck). I look forward to hearing from you and I thank you for your vote!